2013 Camp Dates SIGN UP EARLY! a local farm to see the babies!! $380.00 9:30-2:30. .
provided on Friday morning $435.00 9:30-2:30. 3 Day Christmas Camp-sleigh rides, snow rides only available during this special camp week. . $395.00 9:30-5:00. Students ride each day in groups formed by their level of riding experience to provide for proper instruction. Students also participate in activities geared towards their age, experience and the existing skills of each student. 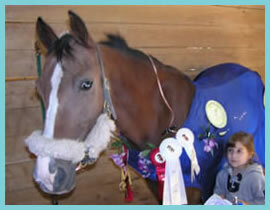 Students learn horsemanship and riding skills while having fun and meeting new friends.